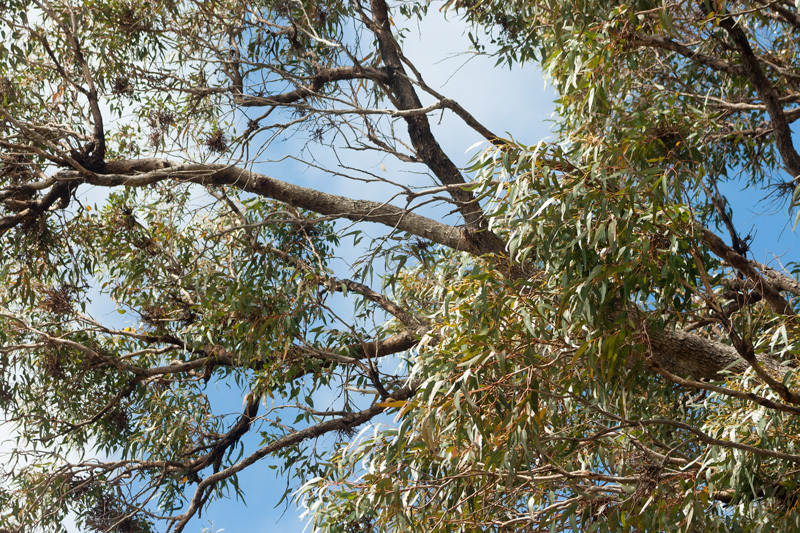 When we were living in Perth our inner city neighbourhood was littered with old tuart trees, bush parks and native vegetation on council owned land. 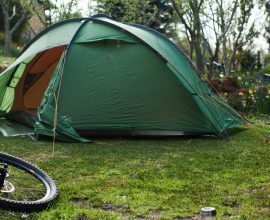 Leaves on the ground and worms in the soil. The benefit to living in an area where the natural landscape hadn’t been entirely flattened for pleasantville suburbs of designer gardens became clear when we received an array of wildlife in the backyard, which leads me to one of the first stories about our backyard wildlife I’m sharing on the blog. 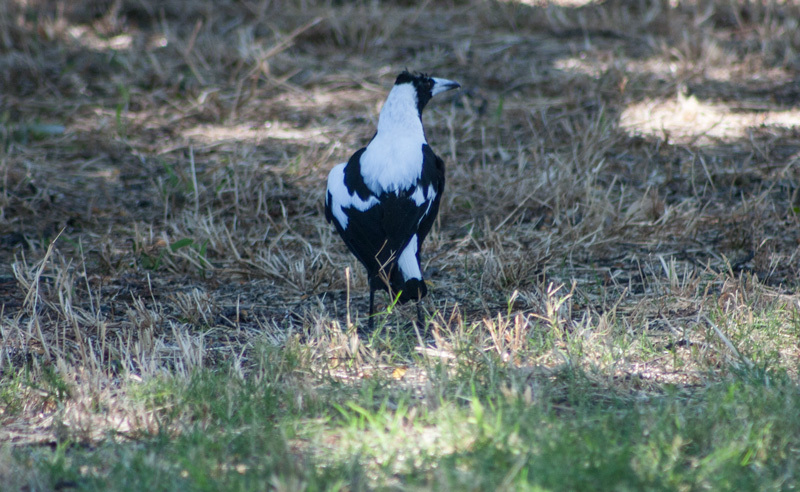 Meeting the magpies, not an altogether rare experience, check out Magpie Whisperer or Penguin the Magpie, this Australian bird is a witty fun animal. 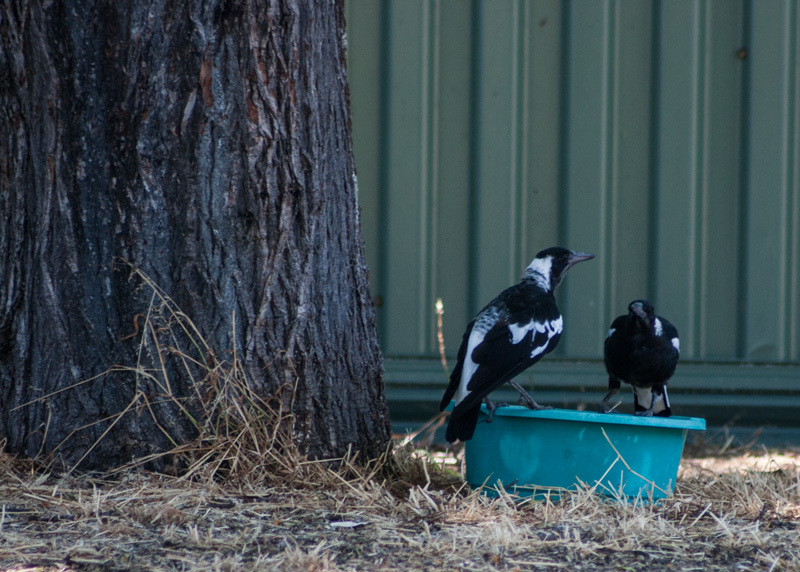 We weren’t aware of the whole family’s presence at first, only encountering the mother magpie flying down under the patio and even randomly following us into the house. 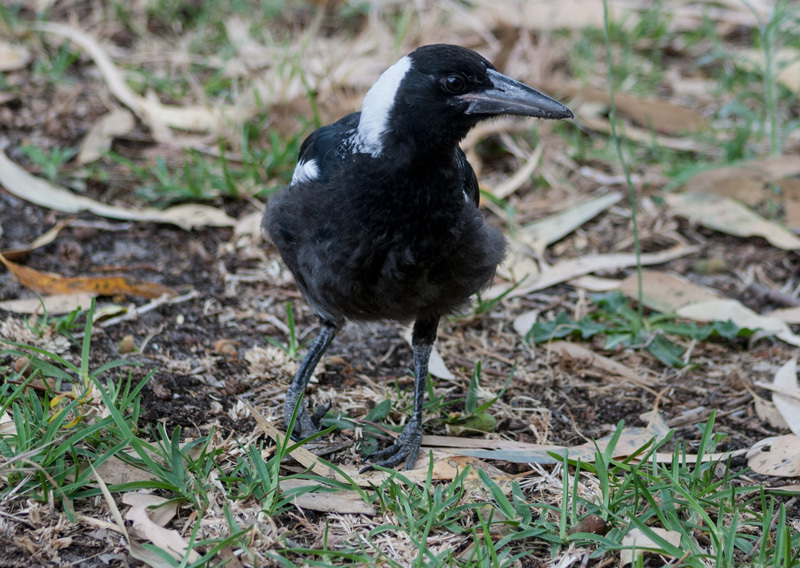 Soon enough one of the fledglings (baby magpie) appeared on the ground, more than likely on its first flight from the nest. We felt a little helpless watching many failed flight attempts and stayed well back because the parents were constantly feeding and coaxing it, so we knew, it’s chances of survival were extremely good without our interference. Though the wind was not ideal, the tiny fluff ball managed to claw up the cape lilac tree for the evening and back on the ground the next morning for a further three days of the same routine, all part of learning to fly. 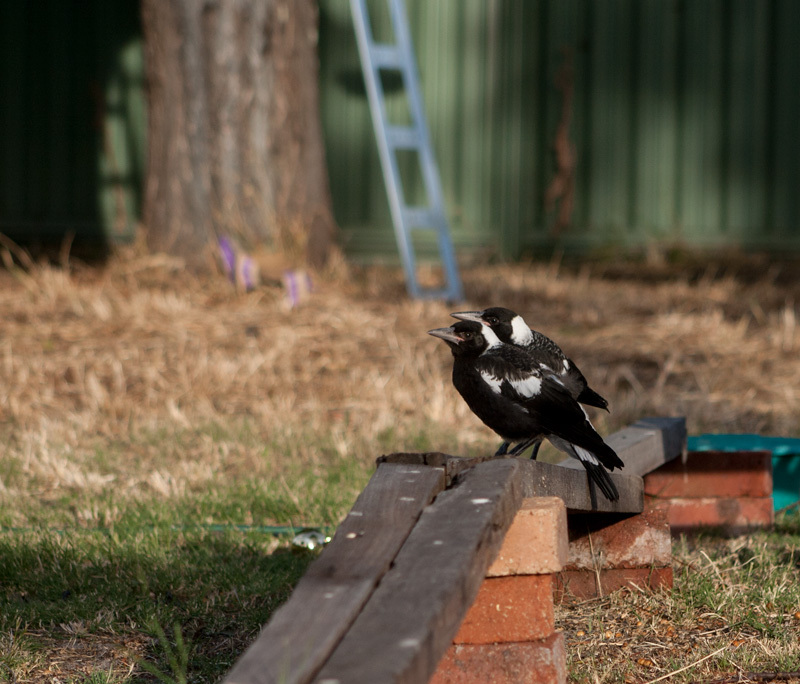 During the week, a second fledgling appeared which we only realised when the two of them were together in the backyard. It was 40 degrees and just incredibly challenging for the fledgling, the long weeds in the backyard left limited cleared space for the little bird’s attempts to fly. I slowly walked out into the backyard to an area where I began to remove the weeds creating a flight path from a pile of sand which I hoped would act as a platform. All the while, the fledgling hidden in a corner and the mother in the tree looking down and surprisingly not swooping me. Once completed, I retraced my steps away slowly to the back door of the house, spying from the fly screen door. 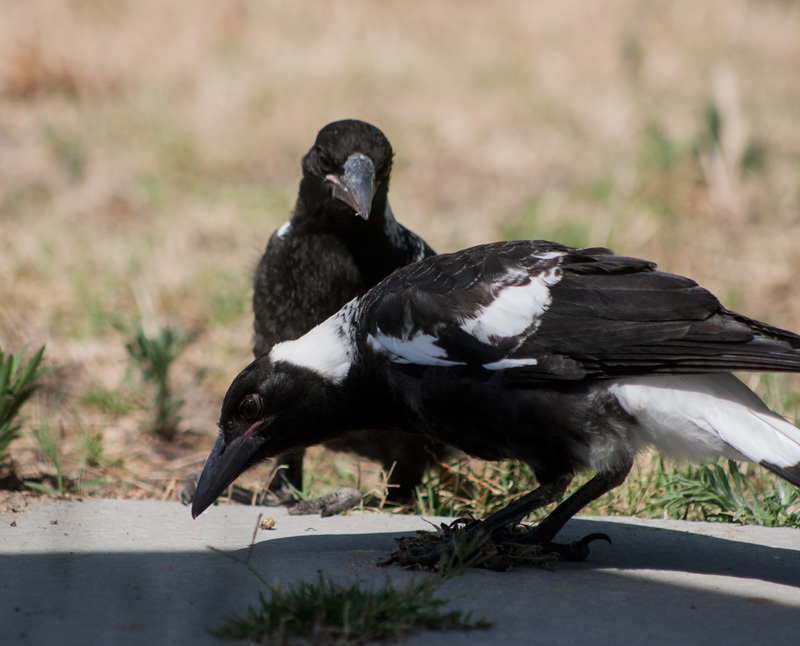 Immediately, the mother deliberately coaxed the fledgling along the path to the makeshift platform, this took some time for the fatigued fledgling, however it was enough to launch into the tree successfully. 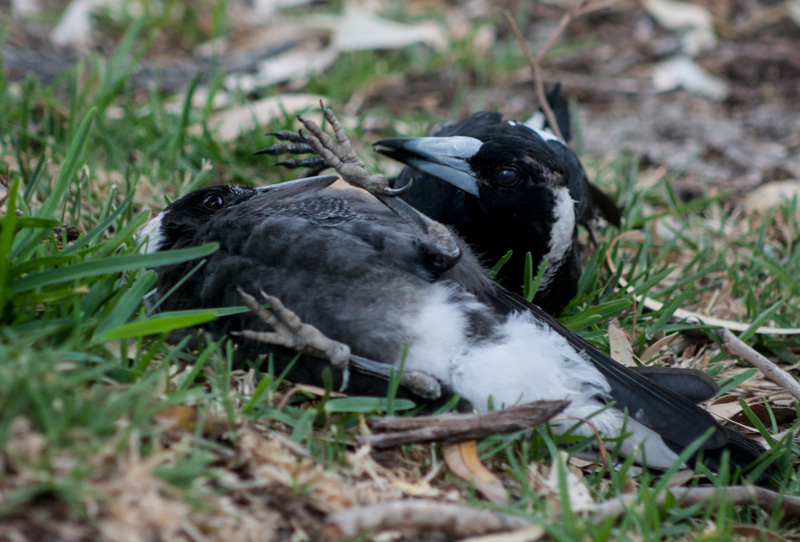 This was remarkable, the fact that the magpie mother seized the opportunity and then proceeded to coach the fledgling. Those early days of the fledglings being on the ground were the most hectic, they were so little and vulnerable, however had every chance of survival with the parents around feeding and teaching them. 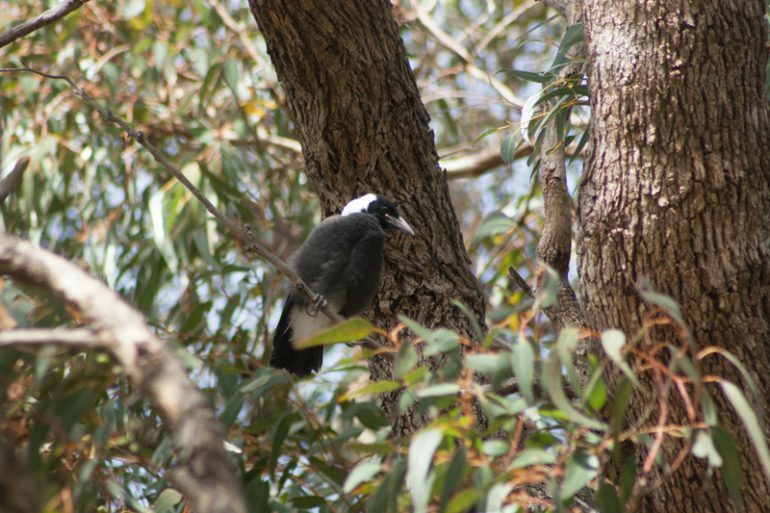 The father on guard perched high in the Tuart tree and the mother swooping anything other than us that ventured into our backyard. The crows were promptly chased away. 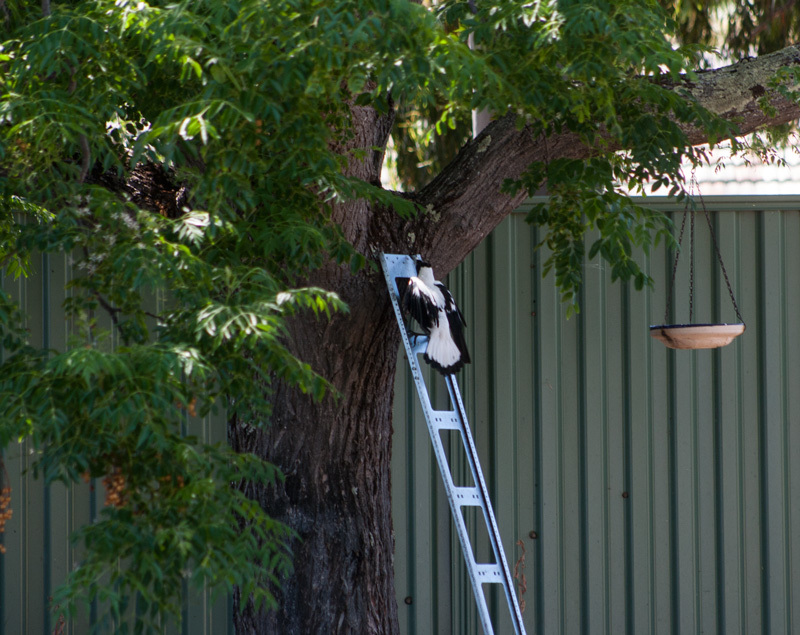 The parents began to take the two on excursions away from the house and they’d be back in the tree by sunset. Then they would disappear for a day to many days as they shed their baby fluff. They would always return and call for us on the front steps, it was a unique experience and weirdly we began to look for them each day. 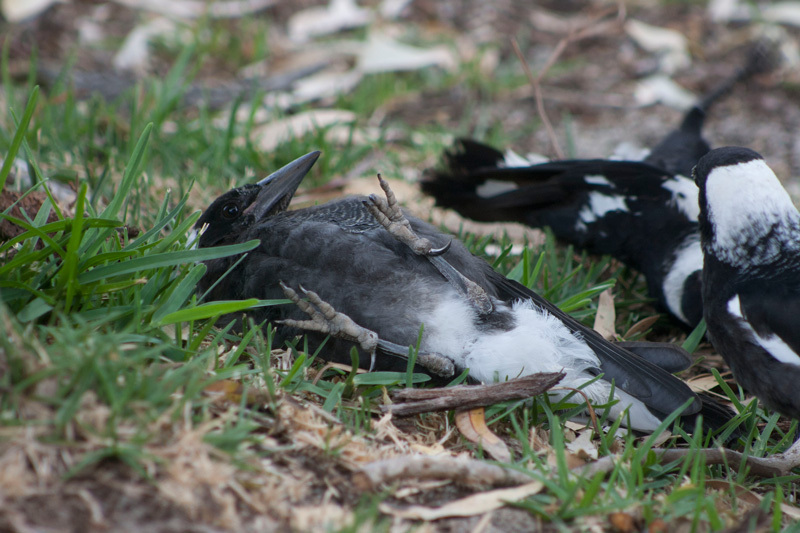 We had some scares finding a few magpies hit by cars and thankfully our magpies were okay. The family despite the aged parents and one fledgling with a injured leg, were quite resilient and remained close together, playing under the sprinkler and rolling around in the lawn. 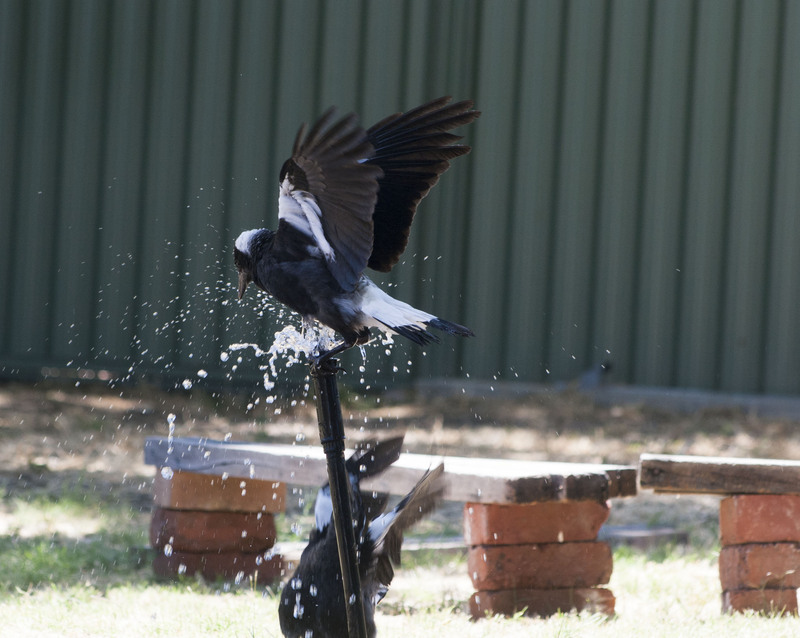 Our encounters with the magpie family definitely changed the way we now look at magpies, making us more aware of their existence and appreciative that in Western Australia, wildlife can live in the backyard, provided there is water, food (native gardens with trees) and shelter. 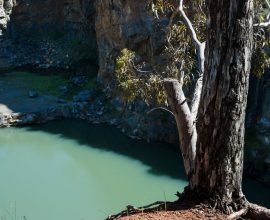 It also helps that there are some native bush parks nearby adding important cluster areas for birds to travel and breed. Be kind to all kinds. 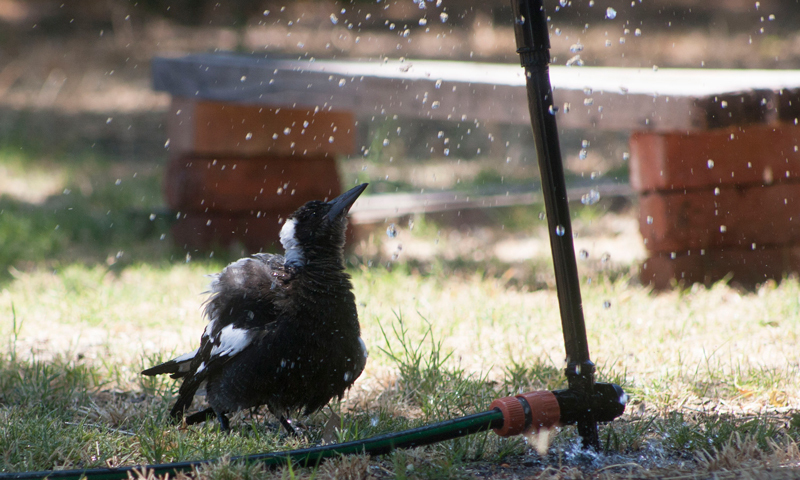 Encouraging birds in the backyard is as simple as planting native trees (for the big birds) and shrubs (for the smaller birds). 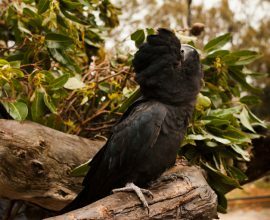 Check out the local park and if it only has black crows hanging around, there is something wrong which you can fix! 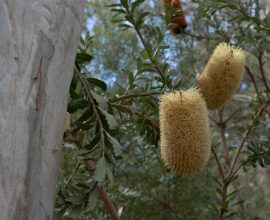 In Western Australia you can ask the local council to plant native trees. 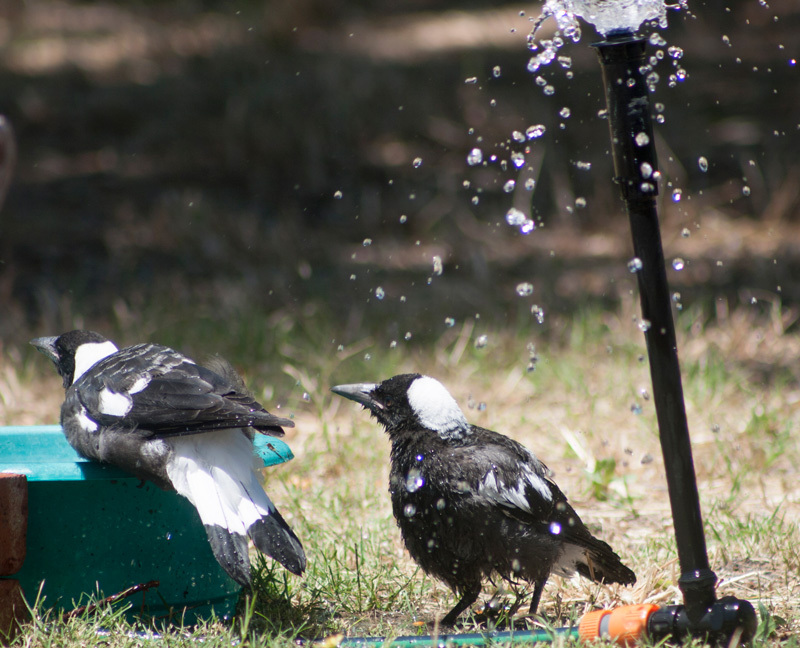 Refrain from feeding birds and keep a bucket of water nearby, cleaned daily. 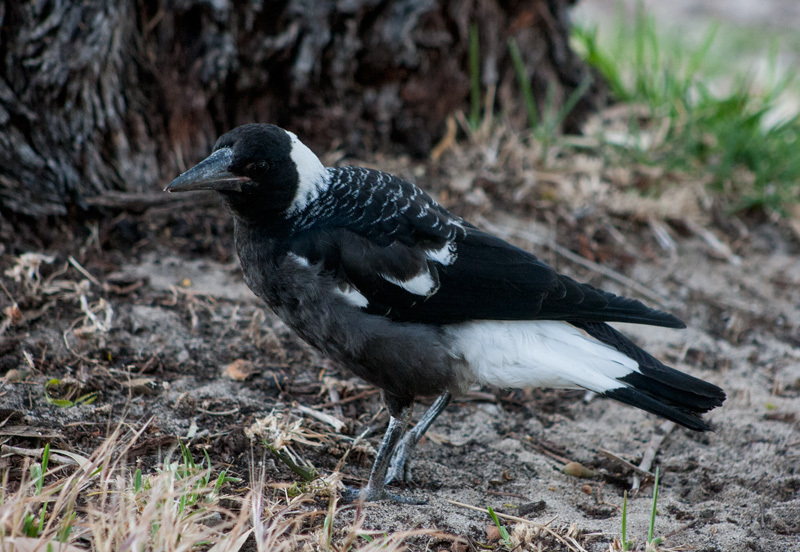 Worms and insects form a part of the Magpie’s diet, mulch lawns and avoid heavy chemical fertilisers. 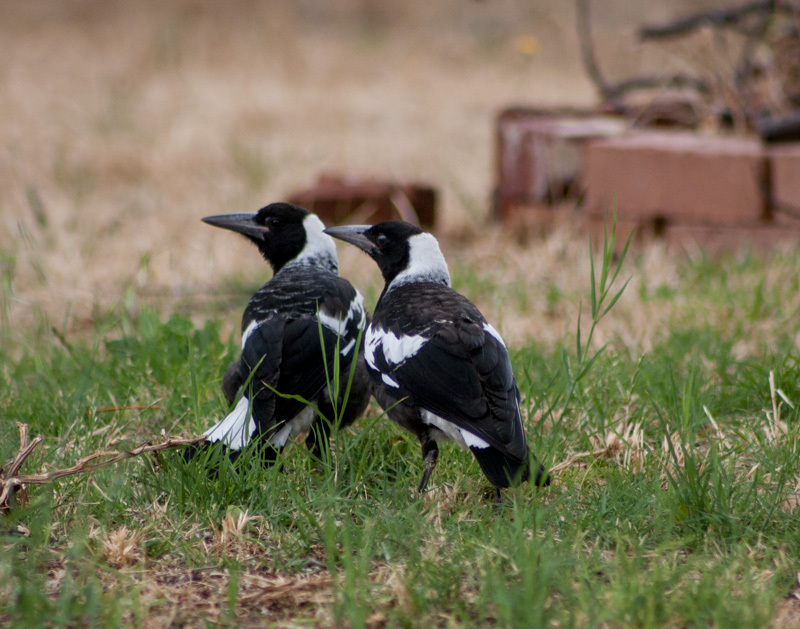 Grasses that seed and flowering plants such as wattles encourage smaller birds, who also require the smaller shrubs for shelter.